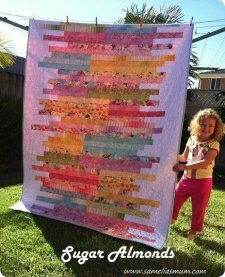 "I’ve had a few requests (and reminders) for this quilt pattern, but haven’t had time to sit down and write it up… until now. I’m pleased to be sharing with you, my Sugar Almonds Quilt Pattern. It is a very simple quilt pattern and suitable for any level of sewing ability. 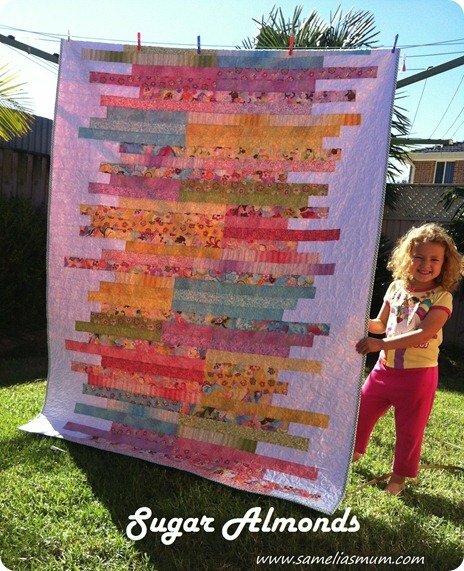 "One of the hardest parts of this quilt, is choosing the jelly roll. With so many beautiful ranges of fabric, it’s hard to decide. 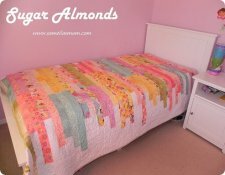 The good thing about the Sugar Almonds Quilt Pattern is that it’s so fast and easy to make, you can finish the quilt quickly. In my quilt, I used a jelly roll of Coquette by Chez Moi for Moda Fabrics. I fell in love with this range of fabric as soon as I saw it.